Sepp Blatter and Michel Platini have both been provisionally banned for 90 days by FIFA's ethics committee. FIFA’s executive committee is being urged to discuss postponing the presidential election at an emergency meeting following the crisis that has struck the world governing body, it can be disclosed. Several FIFA ExCo members including England’s David Gill, Germany’s Wolfgang Niersbach and Belgium’s Michel D’Hooghe are pushing for an emergency meeting to take place, and it is likely to be held the week after next in Zurich. 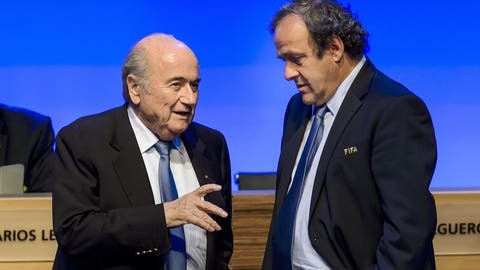 The calls for the emergency meeting come after Sepp Blatter and Michel Platini were both provisionally banned for 90 days by FIFA’s ethics committee. It is understood that the presidential election, due to be held on February 26, would be top of the agenda. It is also likely to be raised at a meeting of UEFA’s 54 member associations which has been called for next Thursday in Nyon, Switzerland – UEFA president Platini filed his nomination papers to run for the presidency just hours before his suspension and postponing the election would help his cause. D’Hooghe, the longest-serving member of the FIFA ExCo, told Press Association Sport: "I am one of the members asking for an emergency meeting of the FIFA ExCo. At the moment I have no information about an eventual postponing of the election but perhaps this point could be discussed there." Gill has contacted FIFA’s acting secretary general Markus Kattner about calling a meeting, and talks are also taking place with Issa Hayatou, the head of African football who is acting president while Blatter is suspended. The deadline for nominations for candidates for the FIFA presidency is due to end on October 26. Prince Ali Bin Al Hussein of Jordan is also planning to run, and it is understood Asian football chief Sheikh Salman Bin Ebrahim Al Khalifa from Bahrain is pondering whether to run himself, as is Kuwait’s Sheikh Ahmad Al Fahad Al Sabah, another FIFA ExCo member. Platini has insisted he is determined to maintain his challenge for the FIFA presidency but the ethics committee provisional ban stands in his way – and he will also have to pass an ethics committee integrity check. The Frenchman has lodged an appeal against the ban, as has Blatter, who was relieved of his duties as FIFA president on Thursday. Klaus Stohlker, Blatter’s friend and adviser, told Press Association Sport: "He has appealed already to FIFA’s appeal committee. He is defending his position and he is sure that he will be found not guilty." Platini has also announced he will challenge the ban, and both cases will now go to the FIFA appeals committee. Football Association chairman Greg Dyke has said the governing body will drop its support for Platini if the ethics committee decides there has been wrongdoing. Scottish FA chief executive Stewart Regan said any move for UEFA nations to back calls for a postponement of the election would have to be carefully considered. He said: "We need to discuss this in more detail and understand the timeline and implications for those involved including Mr Platini – only then would we be able to make a balanced judgement." UEFA said Platini ”will not perform his official duties for the time being”. He did not attend the meeting of the UEFA executive committee on Thursday and has cancelled several official trips. Meanwhile, Korean billionaire Chung Mong-joon, who had intended to run for the presidency but was given a six-year ban on Thursday, has said he will take the case to the Court of Arbitration for Sport and sue the ethics committee. He said: "I will mobilise all legal means available to expose the injustice of this decision by the ethics committee – this includes a formal request to the Court of Arbitration for Sport (CAS) next week. "I plan to sue Mr Blatter for the VISA-MasterCard fraud case and for getting paid by FIFA without the approval of the executive committee which amounts to embezzlement. The ethics committee will also be the subject of my legal actions for damaging my reputation." In another development, the Swiss justice ministry has agreed that another of the seven officials arrested in Zurich in May can be extradited to the United States. Costas Takkas, who has joint British and Greek nationality, was the assistant to former FIFA vice-president Jeffrey Webb at the time of his arrest. He is accused of accepting bribes in exchange for awarding marketing contracts and has 30 days to appeal. Webb is already in the US after agreeing to be extradited. Blatter’s lawyers confirmed they are seeking to overturn his ban. A statement said: "We can confirm that we have requested additional proceedings before the adjudicatory chamber of the ethics committee and filed an appeal with the appeal committee."